My husband tends to be much the same way. He prefers a tomato based sauce. That’s funny because he doesn’t like raw tomatoes. Cooked tomatoes though he’s good with. And gosh, sometimes I think I could give him a bottle of ketchup and he’d be in hog heaven. I’m kind of only kidding and where did the phrase “hog heaven” come from anyway? Maybe I’ll go ask my friend google. But not right now. 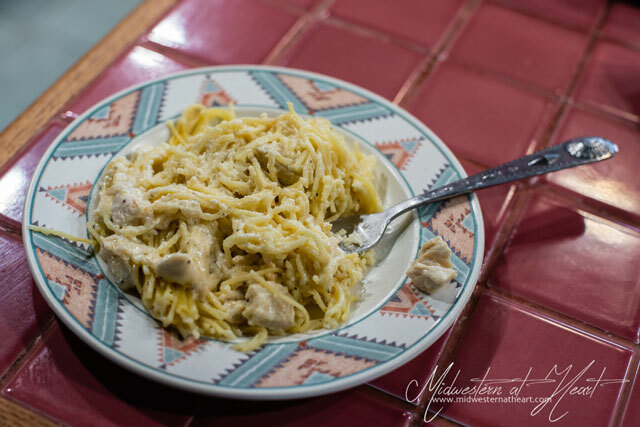 So Alfredo… throughout the years I have tried my hands at many different types of Alfredo. When I was a kid, Alfredo came from a jar. I really had no idea you could make it. That sounds really weird, but no one I knew made it. They just bought the jar and voilá, you had Alfredo… again, that is if you had Alfredo at all. When I got married though, I went on a cooking spree. Don’t believe me? Look back through this blog. This blog was started just shy of 3 months after hubby and I started dating. It’s funny that it chronicles our life together really. Sometimes I’ve fallen off the blogging bandwagon and sometimes I forget to blog things, but really, it’s a story of our life. I sometimes have a love/hate relationship with this blog. #truth. But I’ve tried my hand at making a lot of things. Some have worked. Some have failed. There has been flour and powdered sugar and cocoa powder all over my kitchen. I’ve made messes. Heck, I even cried because I had to clean up said messes. It’s all part of life though. Attempt #2 was a mistake though… More of a mistake on making the pasta more so than on making the Alfredo, but you live and you learn. We might have laughed a few times. And that was back in my skinny days… just making note! 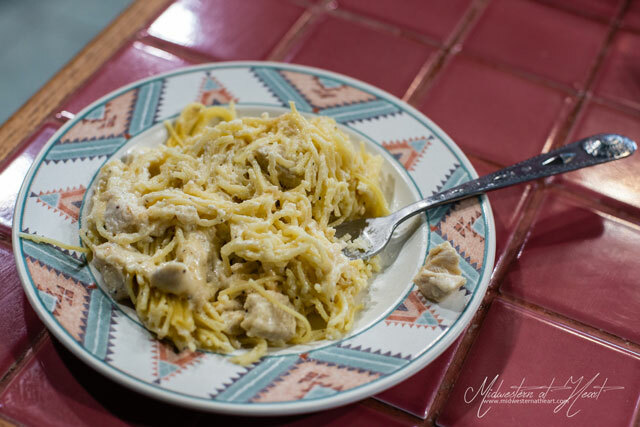 Then in 2012, I came across the recipe for Garlic Alfredo Sauce on Tasty Kitchen. Gosh, I was sold. I was sold so much so that that is my go-to Alfredo sauce. And when anyone asks… that’s what I send them. So, I thought leaving it on my list gave me a reason to make it. Heck yeah! And make it I did. While we’ve been working on remodeling our house, we’ve eaten a lot of pizza, burgers, taco bell (or as I like to call it Taco Hell, just cause). Truthfully, I’m tired of all of the above. So one night last week I surprised us all with Chicken Fettuccine Alfredo. It was a nice change! Bring water to a boil in a large pot. Cook pasta according to package directions. Now all the Food Network Hosts say that you should heavily salt your pasta because 1) this is the only chance you get to season it and 2) it should be rolling around in salt water. Meanwhile, melt butter in a medium, nonstick saucepan over medium heat. Add garlic and cook for 2 minutes. Add cream cheese, stirring with a whisk until smooth. Remove from heat when sauce reaches desired consistency. Sauce will thicken quickly. So now you have Alfredo Sauce, whatever will you do with it? How about make some noodles! While the sauce is cooking, cook your chicken. I prefer to cut up into long strips and then add olive oil into a skillet. Heat the skillet and then add the chicken. Make sure to salt and pepper it for flavor. Once it has cooked, remove to a plate and let it sit until you are ready for it. To help keep it warm, you can put a foil tent over it. 1/4-1/2 cup flour, some Italian seasoning… dip the chicken and pan fry it! YUM! I have been craving Fettucine Alfredo lately…which is odd for me, because, like your hubby, I’m more of a tomato-based sauce fan. I think I have only tried to make it once before, but my sauce-to-pasta ratio was way off and it ended up being way too dry. I’ll have to give it another shot soon! !